Flavours of Malaysia Restaurant - Experience Exotic Cuisine in the Berkshires! GPS: please use 62 McKay St.
• Upon request, any entree can be cooked gluten free. 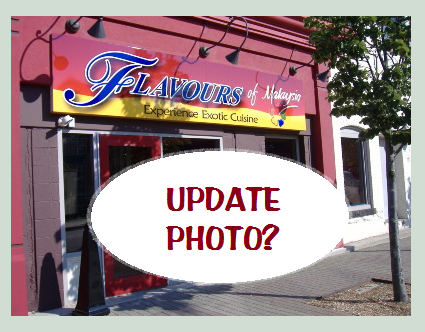 • Flavours does not use MSG. • Vegetarian dishes are offered. If you are a Vegan, please be informed that Pad Thai and Tom Yum dishes are cooked with fish sauce. • Before placing your order, be sure to inform your server if a person in your party has a food allergy. • All entrees are cooked to order. Please allow yourself enough time for your meal to be prepared. We take our food seriously. • Bring any special preferences to the attention of your server when ordering. Welcome to Flavours Restaurant, a new and exciting dining experience in the beautiful Berkshires of Western Massachusetts. Our restaurant menu features flavors from around the world, including Malaysian, Asian and America cuisine. Malaysian born owner, Sabrina Tan is well known within the Berkshires for her culinary excellence and has had the privilege of serving many world famous celebrities. Whether you are a first time visitor to the Berkshires, a returning visitor or a local resident, make plans to join us for lunch or dinner. In addition to our extensive menu, we offer a full service bar and a great entertainment schedule. Conveniently located on downtown in Pittsfield, MA, Flavours Restaurant is an easy ride from the northern Berkshire as well as southern Berkshire areas and if you are in central Berkshire County, we are just minutes from downtown Pittsfield, the Colonial Theatre and Barrington Stage Company. The Berkshires offer a vast array of excellent restaurants featuring simple dining to gourmet excellence …at Flavours we pride ourselves on exceptional dining and service. We not only offer our dining guests classic American cuisine, but also favorites from the five continents of the world, especially a South East Asian cuisine, with a delicate blend of many special herbs and spices. Remember, at Flavours Restaurant, there is always something for everyone to wake up his or her sense of taste. Malaysian food is not one particular distinction of food but a culinary diversity originating from it's multi-ethnic population of Malay, Indian, Eurasian, Chinese, Nyonya and the Indigenous peoples of Borneo. At Flavours, we offer the most authentic cosmic array of food that has now come to be known all over the world as 'Malaysian Food'.